DCRUST Recruitment 2019 - Apply Online for Apply Online for 83 Group C & D Posts in DCRUST, Haryana on Direct Recruitment. 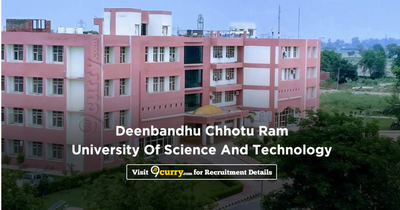 Online Applications are invited by Deenbandhu Chhotu Ram University Of Science And Technology from 28 Jan 2019 to 20 Feb 2019 11:59 AM for 83 vacancies. Eligible candidates may apply online at Not Available's website (direct link is given below) from 28 Jan 2019 to 20 Feb 2019 11:59 AM. Candidates log on to https://www.dcrustedp.in/recruitment/. Click on "Apply Online" & Read the information carefully. Click on “Proceed to fill Online Application Form”, if you are a new user.